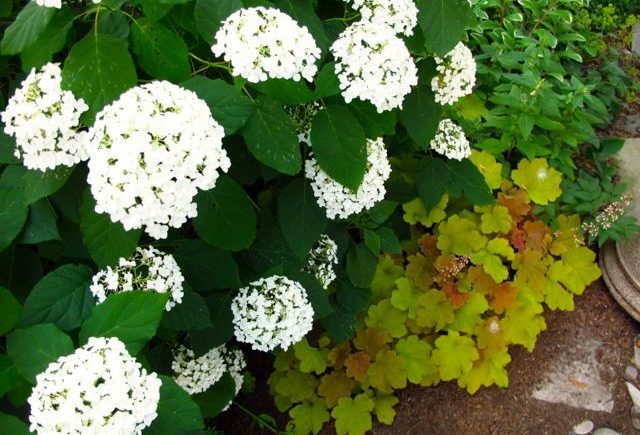 I chuckle when people say “nothing will grow under Norway maples.” Then I point to a scene like the one above, growing in my doubly Norway maple-shaded, root-infested, deeply sandy garden – the indomitable ‘Annabelle’ hydrangea, fattened on a regular diet of chopped leaves and, recently, duck manure. Yes, things will grow under Norway maples, but you do need to give them a helping hand. 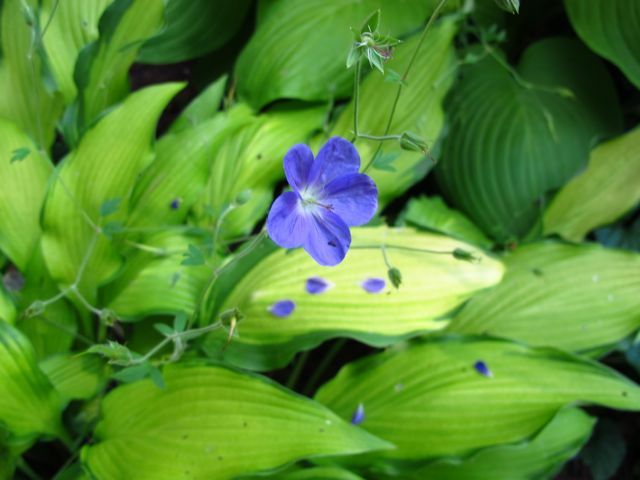 Here are a few of the other survivors in my July garden, presented for Garden Bloggers Blooms Day, the brainchild of Carol of May Dreams Gardens. That’s when gardeners around the world show what’s growing – on dry, mapley shade or (if they’re lucky) otherwise – every 15th of every month. 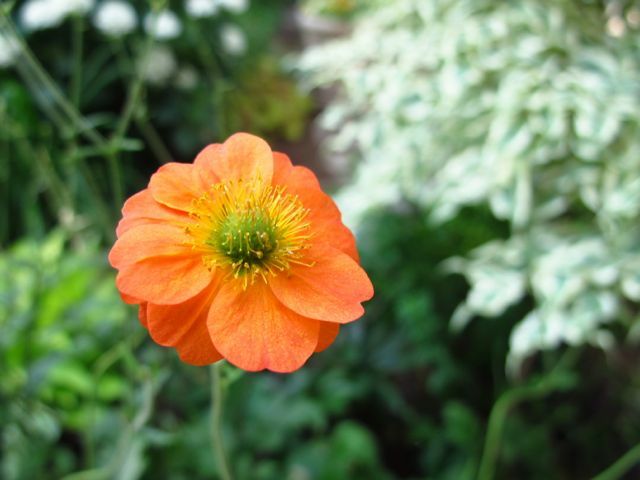 Geum ‘Totally Tangerine’ has been a bloom factory over the last month. Had I stayed on top of deadheading, this single bloom might have had company. But deadhead I did, finally, and now new flower buds are forming, so perhaps it’ll get its second wind. A great plant in its second year. In part shade, it did need a few twiggy stakes to prevent sprawling. Before Geranium ‘Rozanne‘, the improved ‘Johnson’s Blue’ was G. ‘Brookside’ – here blooming through Hosta ‘Pineapple Upside-down Cake’. Though a bit sprawly, with its main flush finishing now, it still flowers for me in shade better than the acclaimed “Chelsea Plant of the Centenary” G. ‘Rozanne’ does. So plant and place are inextricably related. 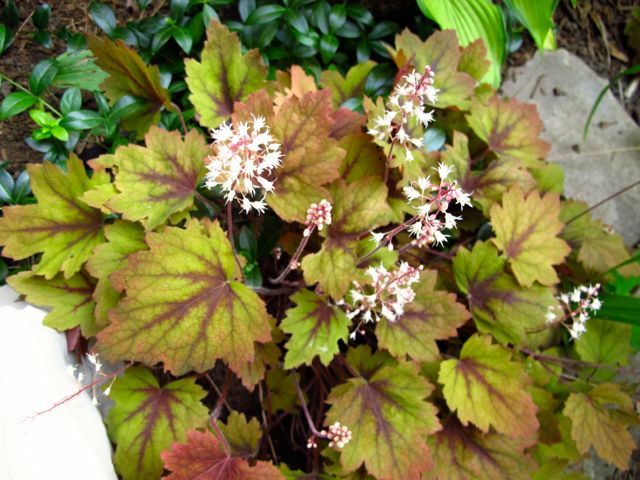 The frothy white flowers of Heucherella ‘Sweet Tea’ are more like those of the foamflower (Tiarella) parent of this hybrid. A pretty, if quiet, addition to the garden picture. Say what you will about the common ditch lily Hemerocallis fulva, it does stand up to dry shade. Not as flowery as it would be in sunshine, but a welcome blast of colour. Unfortunately, the flaccid, dead flowers aren’t quickly self-cleaning. The other day, it occurred to me that they look like used condoms. Wish I hadn’t conjured that image. You’re welcome. Oh, Heucherella 'Sweet Tea" is so fabulous! The combo of Annabelle and Caramel Heuchera is quite nice too. Not only are the old daylily blooms reminiscent of used condoms, but often if you take them off without gloves, they drip into your hand. Another nasty, squishy image. I'll never see H. fulva the same way after your description, lol! And it's blooming everywhere in Toronto now! Wow! 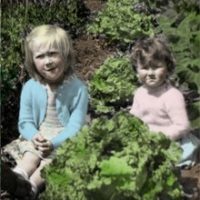 Incredible garden beneath Norway Maples! Thank you for the lovely image of H. fulva! I inherited quite a lot of them growing out on a small bank that goes from our house to the sidewalk. We live in an urban area across the alley from a home for people with mental disabilities. I used to be disturbed by the used condoms left on the sidewalk or thrown into the daylilies. Now I can see it as an homage to the plant or perhaps a design element echo. I call the spent blooms of daylily 'soggy socks' — less of an unpleasant thought. 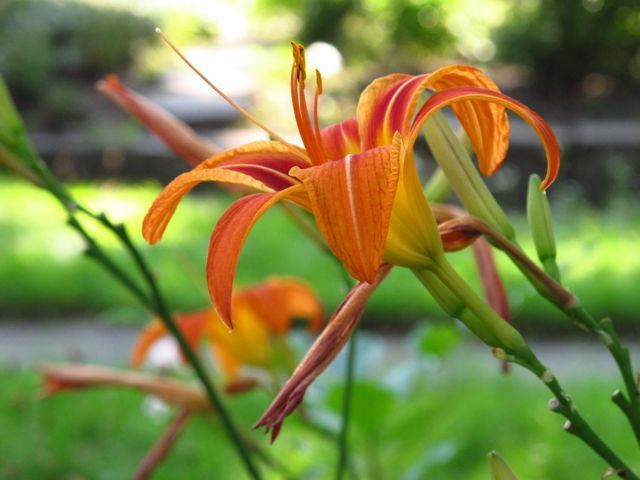 If you don't want to see them, deadhead late in the evening and you'll have pristine daylilies in the morning. All looks so lush. Love the delicate blooms on the heucherella. 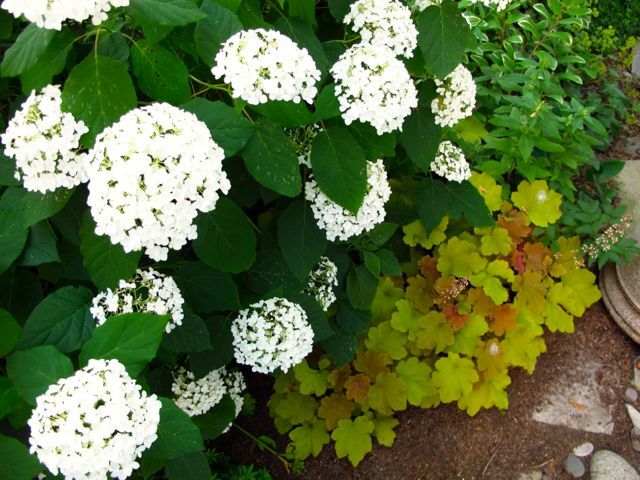 By strange coincidence our Annabelle hydrangea is also under a Norway maple and thrives there. Not in flower yet, 'though although the other plants you show are. Still chuckling over the daylilies! See you back on twitter. Co-incidence we decided to follow each others tweets before realising we also followed each other here! At least it confirms that we're consistent! I love the orange color of that 'Totally Tangerine'. I adore Hemerocallis fulva, especially since it covers whole banks and ditches in our area, and regardless of all the unsavory associations one could come up with for the spent flowers. Then again, I have been reading a whole lot of academic writing about flowers in art and literature of late which all seems to suggest that there is a sexual and transgressive aspect to the aesthetic appeal of flowers to begin with. I keep seeing that Geum everywhere I go. It must be calling my name unlike the ditch lilies :). Happy belated GBBD!